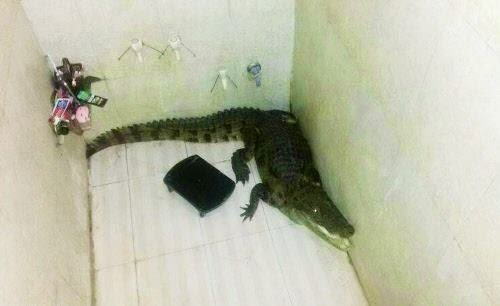 TOI - ANAND: A five-foot crocodile entered into a bathroom in a residential society in Sojitra town of Gujarat's Anand district. The encounter happened on July 21. The Patel family was shocked when it saw that the five foot long crocodile had occupied the bathroom of their house. Bharat Patel was entering the bathroom when he saw the crocodile in the corner. Patel immediately locked the bathroom from outside and informed his neighbours about the presence of the wild animal in his house. Later forest officials reached the spot to cage the animal which was released in a lake in Malataj village of Anand district.